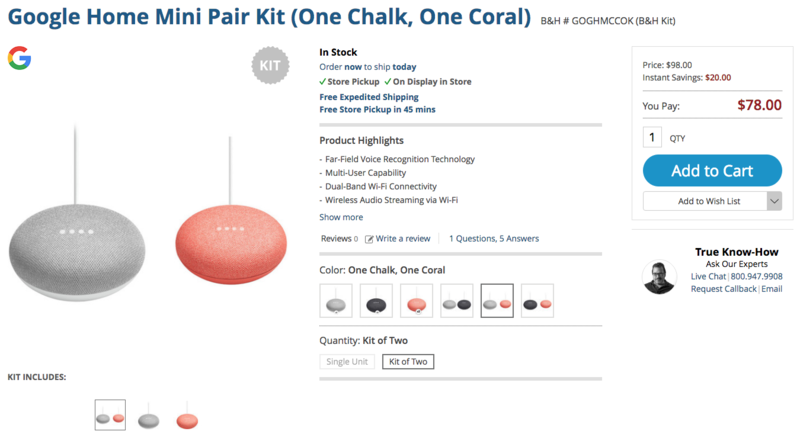 You may have seen in our Google Store sale post that you could pick up two Home Minis for $58. Well, it seems like Google has decided to expand this to a manufacturer sale, meaning that multiple retailers are now offering the same deal and you now have a wide selection of stores to choose from. Keep in mind that the Google Store still offers the most combos, with B&H coming in at a close second. You won't be able to use any of those ubiquitous 25% coupons at Bed Bath & Beyond, and B&H only charges tax in NY and NJ. The sale will end on June 17th, so you have a bit of time to decide whether you want some more Home Minis or not.